Namine’s seventh birthday is tomorrow, and she was thrilled to help bake her cake. Namine had already picked out the kind of cake she wanted — confetti, or as the box said, “funfetti” — we just needed to make it. The more difficult part, the fondant, was already made and waiting in the fridge. When asked what kind of cake she wanted — aside from the type of batter — Namine said “a heart cake.” That was simple enough; instead of a single 9 × 13 pan, we just used a square pan and a round pan. In addition to the shape, she wanted an Elsa cake. While I was flattered that Namine thought I could draw Elsa, I was a little intimidated. Still, I was determined to do right by her. 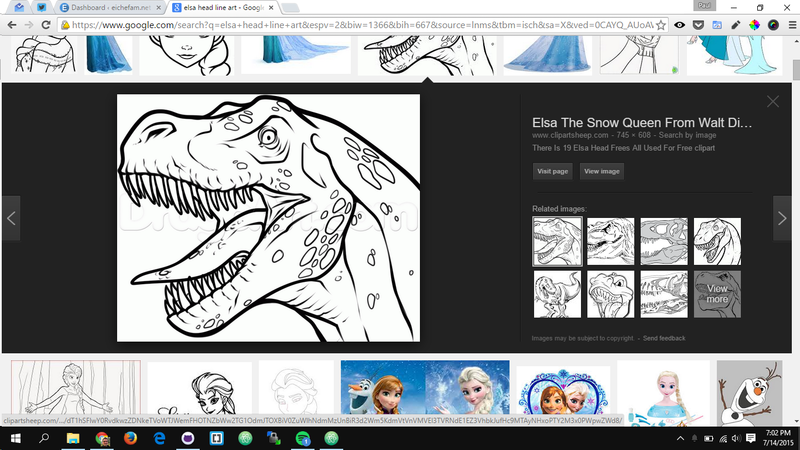 I did a Google Image search for “Elsa head line art” and found a lot of good results. And one great result. No, Google. That's not Elsa. Namine didn’t want Tyrannosaurus Elsa, though. I asked her if she wanted a realistic Elsa (or as realistic as a line drawing on a cake could get) or a chibi Elsa. She said chibi, definitely. So I set to work, and ended up with three fairly decent examples. While Namine got herself ready for bed, Jessica rolled out the refrigerated fondant and covered the cake. I helped by taking pictures. With Namine’s heart cake all covered, it was left to me to draw (paint) Elsa. I told Namine that it would probably turn out better if I just did her face, and not her whole body. She said that was fine. She picked out the drawing she liked the best, and I took it from there.